On October 17th, a group of concerned neighbors met with First Ward Alderman Proco “Joe” Moreno at Letizia’s Fiore, 2456 N California Ave. The meeting was hosted by Letizia’s co-owner Fabio Sorano. Sorano has led the charge to improve dangerous traffic conditions at the intersection of California Ave and Altgeld St, outside of where his business sits. The stretch of California Ave between Logan Blvd and Fullerton Ave (one block north and south of Altgeld, respectively) currently has rush hour parking restrictions in place. This means that during the morning and evening rush hours, parking is prohibited on one side of the street, thereby allowing automobiles to move in two northbound lanes in the morning and two southbound lanes in the afternoon (toward and away from the Kennedy expressway, respectively). Pedestrians crossing California here face considerable danger. Drivers rarely stop for pedestrians, as the law requires. Conditions are especially bad when the rush hour parking restrictions are in effect, but the intersection remains dangerous throughout the day. Unfortunately, the presence of rush hour lanes rules out a number of potential infrastructure projects that would improve pedestrian safety. Stop signs, middle-of-the-road pedestrian signs, curb bump-outs, and bike lanes are all prohibited here by CDOT guidelines because of the presence of rush hour lanes. However, the neighbors who gathered at Letizia’s were pleased to hear Alderman Moreno announce that an ordinance has already passed the city council which will remove rush hour parking restrictions on California Ave, between Logan Blvd and Fullerton Ave. In addition, Moreno has agreed to use his ward’s 2014 menu funds to install traditional bike lanes on this stretch of California. Both moves warrant praise, as they will significantly improve safety for pedestrians. 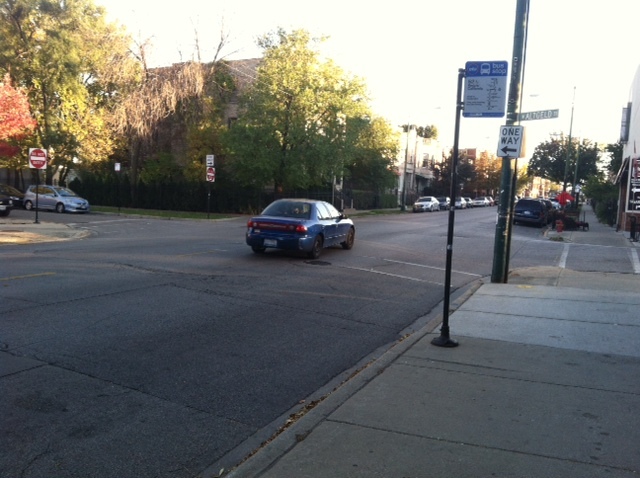 As for bicyclists, we encourage Alderman Moreno to partner with CDOT to implement the safest possible street design. California Ave represents an important bike route. According to the Chicago Streets for Cycling 2020 Plan, California is slated to become a cross town bike route through Logan Square. While traditional bike lanes (without a buffer or a barrier) will be a welcomed improvement, they will fall short of the ambitious safety goals set by the Streets for Cycling Plan. 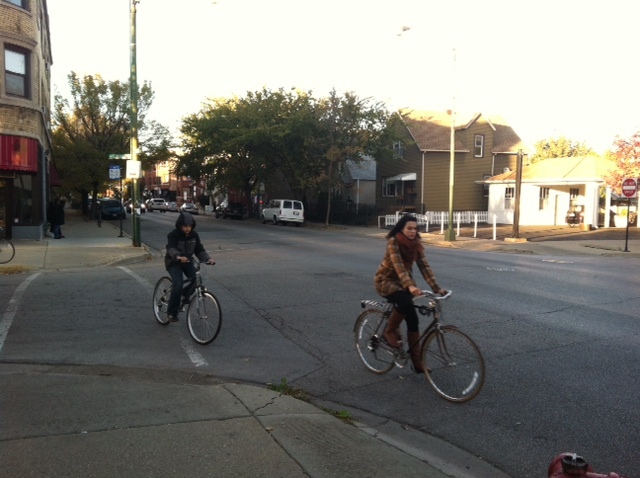 Granted, it will be a challenge to design considerably safer bike lanes on such a narrow street as California Ave. But, considering the level of demonstrated local support, perhaps this is one place where the city should find a way. Update: the northbound rush hour lanes on California Ave are only open in the morning, and the southbound lanes are only open in the evening. A previous version of this post mistakenly declared that both lanes are open at both times.